If you're planning on sticking around for longer—a lot longer—than a standard human lifespan, you'll need a watch that keeps time on the galactic level. Van Cleef & Arpels' new Complication Poétique Midnight Planétarium will certainly fit the bill. 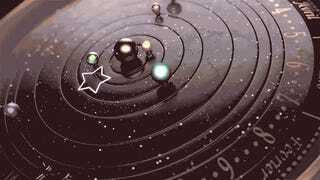 Instead of hands denoting the hours and minutes, it incorporates six of our solar system's planets rotating a tiny version of the sun in real time. So while Mercury will make a lap around the watch's face in just 88 days, Venus will require 224, and Earth of course does it in exactly a year. Saturn, on the other hand, the farthest planet from the sun included on this piece, won't make it back to its starting position for a whopping 29 and a half years.